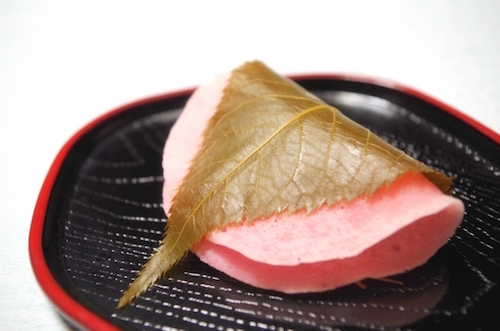 Home › Style › Sakura-mochi: How About Some Rice Cakes with Red Bean Paste Wrapped in a Cherry Leaf? You’ll know spring is coming when you see it being sold at the shops around Japan. This delicacy is a traditional Japanese sweet called “Sakura-mochi” because it utilizes a cherry leaf (“sakura” means cherry blossom in Japanese). As you may know, most Japanese sweets are sugary, and this is no exception. But a cherry leaf that has been soaked in salt for a couple days works to offset the sweetness on your tongue. In addition to that, its scent naturally leads you to imagine a cherry blossom in your head. Basically it can be said that there are two kinds of rice cakes, split by eastern and western parts of Japan. Both of them are wrapped in a cherry leaf, but there is a little bit of a difference when it comes to the ingredients. The eastern one is called “chomeiji (長命寺)” and usually makes use of a flour dough. 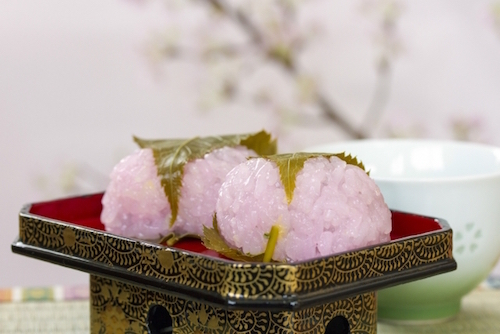 On the other hand, glutinous rice is the main ingredient in the dough of the western one, called “domyoji (道明寺)”. With the former, the red bean jam which is found in many Japanese sweets, is cradled between folded dough like a taco, while in the case of the latter, it is enclosed with one made from glutinous rice. These ingredients can make for a substantial difference in texture, appearance, smell and color. In this case, that difference occurs in the texture. “Chomeiji” texture is similar to manjyu (a firmer, slightly more cake-like traditional sweet made with wheat flour, with sweet red beans in the middle), whereas “domyoji” is like a soft rice cake. Therefore, with domyoji, you get to enjoy a more chews, elastic consistency. Of course there is a reason why “Sakura-mochi” was born in the past. It is said that during the Edo era, a man who had been assigned as a gatekeeper was in trouble because he had too many cherry tree leaves during spring. Then he thought of one way to recycle them by accident, which is how “chomeiji” was born. On the other hand, it is not clear how “domyoji” was born long ago, but one legend is that it had been cooked as a preserved food in Osaka during the Edo period. Here’s to hoping you have a happy and warm spring, all the while finding great satisfaction with these sophisticated Japanese sweets.